Amaryllis, has been called queen of the window garden – brilliant colors, beautiful simple pastels, striped and bordered blossoms holding geometric fascination, capped off with pure white blossoms seem to be a little bit of Heaven. Originally, a dainty flowered species from South Africa, the Amaryllis is now cherished for its ability to produce beautiful huge blooms indoors during the winter months. Amaryllis are not all bloom – a well grown plant has foliage, giving needed height indoors. When buying or ordering online Amaryllis bulbs, select bulbs at least 2 1/2 inches in diameter. Larger bulbs 4 inches in size with produce better, and smaller bulbs will not bloom. The larger bulbs often develop two flower stalks instead of only one. Check the bulbs for firmness and they should be free of soft spots and discoloration. When planting bulbs in soil use a pot or container that has drainage holes. Amaryllis can also be “planted” in a vase with no soil – see the video below. The container or pot should be roughly two inches larger in diameter than the bulb – 4 inch bulb = 6 inch pot. The potting soil mix should drain well; a 50/50 mix of peat and perlite works well. When potting, cover two-thirds of the bulb with soil, and leave the rest uncovered. Thoroughly water the soil/potting mix after planting. Keep the mix consistently moist NOT wet. When watering, do not allow water to get into the nose of the bulb. Water if it seeps into the bulb may cause the bulb to rot. During the rooting phase and early stalk development. Keep the bulb in a well-lighted room/area, room with temperatures around 70-75 degrees. When flower buds begin forming, reduce the temperature to around 65 degrees. During flowering, and help extend flowering time, keep your plant in bright, indirect light. It helps to give the pot a half turn every two or three days so it gets an even amount of sunlight on all sides. As the stalk develops, fertilize (liquid plant food is easiest to apply in small quantities) with a complete fertilizer – (containing nitrogen, phosphorus and potassium). Follow the fertilizer labeled directions on how much to apply. Fertilize about every 2-3 weeks. 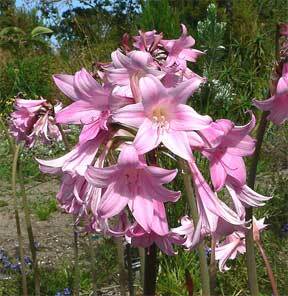 Your Amaryllis should begin flowering 6-8 after bulb planting. Depending on a room’s temperature and light levels flower duration will vary. Cut off each flower as it fades, no use wasting energy trying to produce seeds. When flowers have all faded, remove the entire flower stalk, cut the stalk as close to the bulb as possible – but do not remove the leaves. The leaves continue to produce food and strengthen the bulb for future flowering again next year. Now treat it like any other houseplant. When warm weather returns, the plant can be moved outdoors. The key to ongoing success with amaryllis is keeping the foliage alive to feed the bulb. When storing bulbs, be sure that they are clean and free of disease. Place them neck up in sand or peat moss. Watch at all times for diseases, poorly developed bulbs or pest infestation. 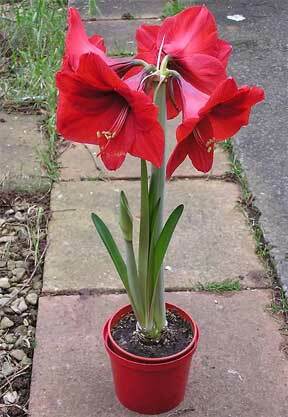 Although amaryllis are nearly disease free, there is the red fire disease which proves very harmful if not checked. A good treatment is a strong solution of Lysol – two teaspoons to one pint of water. Remove the bulbs from the soil and soak three to five hours in the solution before replanting. Control red spider and mealybugs with any good house plant spray. Mealybugs can be especially mean. Scale, a roundish tan-colored sucking insect, may attack amaryllis. If in small numbers, they may be wiped off with a soft cloth. Otherwise, use a spray for them. The tiny black, thread-like thrip may also attack amaryllis, but it is easily controlled with a natural insecticide like neem spray oil. During the latter part of August, or when the nights begin to be cool, gradually reduce watering your amaryllis, and stop feeding. The leaves should begin to yellow and die for their natural dormant season. As the weather becomes cooler, bring the plants indoors and remove all of the old leaves. A cool basement around 50 degrees is an excellent place for amaryllis during their period of rest. After a rest of six or eight weeks, bring them back to a warm window and repeat the cycle.